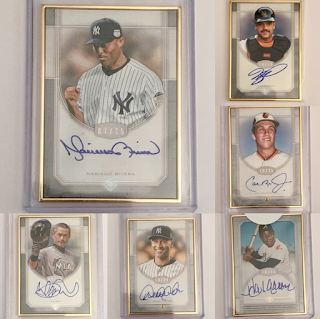 If you frequent our website, you know we did rather extensive coverage of 2017 Topps Transcendent Collection, but the most viewed page was our Transcendent Card Tracker. To gather information for the Tracker I got in contact with some of the collectors who were buying cases, heard their stories about collecting and their appreciation for the release. As I became more familiar with these collectors and this set, I started to understand the attraction. I also grew to appreciate these high end collectors who were so generous with their time and their willingness to share information. Granted, Transcendent is a release that, per case, is out of range for the vast majority of collectors. But there were plenty of opportunities for most collectors to pick up some of these cards within their price range, either through the 50+ group breaks or buying individual cards on the secondary market. Here are the cards I have obtained from the set. Each one of these were autographs I needed for other Micro Collecting projects I’ll share with you soon. For now I want to point out something I noticed about the photo selections for these cards. Let’s start with Cal Ripken Jr.